Nowadays, a website is crucial for doing any business, but how important is a mobile website? The answer, of course, is EXTREMELY. But why is this? Well, there are many reasons. Studies show that mobile shopping now exceeds laptop/PC shopping time. Since June 2013, the majority of online shoppers have been shopping through mobile devices at 55%, and continues to climb. There also tends to be a misunderstanding in terms of who should have a mobile friendly website. Many tend to think that this concept applies mainly to businesses using eCommerce, but in reality, applies to all businesses. According to a 2012 Google Survey, the results showed that 74% of visitors were more likely to return to mobile friendly websites, 61% were likely to leave a site if it wasn’t mobile friendly, and 67% were more likely to buy at a mobile friendly website. The conclusion; if your site isn’t mobile-friendly, you’re losing business. If you’re not losing business yet, you will. 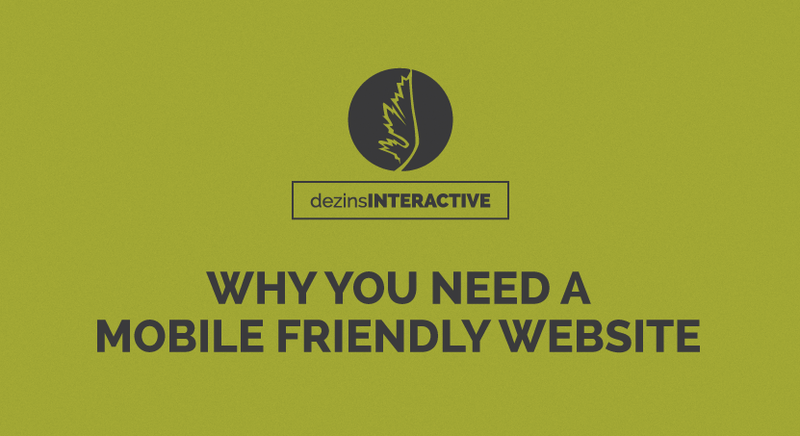 If your site isn’t mobile-friendly, you’re losing business. In this day and age, the majority of your customers are not sitting in front of a computer screen, they are on the go on their mobile devices. So what does that mean for you? If you don’t give your customers easy visibility and navigation so that they can browse or shop on their mobile devices, they’ll go someplace else. A mobile friendly website is what your customers want, and they expect you to provide it for them. So how do you go about creating a mobile friendly website? Because mobile phones have smaller displays, they will often distort visuals on regular websites. Simplify your mobile website, include only essential features, include content with links that lead to secondary information, enlarge interface elements for easy touchscreen navigation. Keep it simple, it’s what your customers want. But don’t forget about your desktop and laptop users, although they’re in smaller numbers, they’re equally as important. So what’s one of the easiest ways to set up a mobile friendly website? The answer of course is to set up a responsive friendly website, which means that it automatically detects the device that you’re using to browse the internet whether you’re using a PC or Laptop, tablet, or cell phone. Also, did you know that Google may penalize you for not having a mobile website? Why is this? Why do they care so much? Well, for example, if your website isn’t mobile friendly, Google will recognize it and will be less likely to display your website as a legitimate search result. If your website isn’t mobile friendly, Google will recognize it and will be less likely to display your website as a legitimate search result. But most importantly, without a mobile website, you will lose business, very fast and very quick. If you don’t have a mobile website yet, the decline is already taking place whether you are aware of it or not. Regardless of what your business does and the clientele you seek, one thing will always be universal; you always have to provide your customers with what they want, or in terms of a mobile friendly website, fast loading pages, easy navigation, and a streamlined site with great content and great products. So grab hold of that growing number of customers, embrace the era of mobile friendly websites, and watch your business reach new heights.